Like most people of a certain age, I’d not ridden a bicycle much since I was a child. 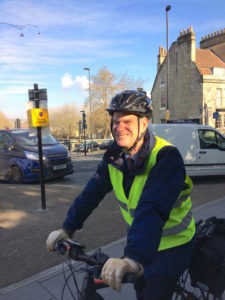 I had a bike in the shed but hardly ever used it – being a fat, middle-aged bloke, Bath’s steep hills are too tricky to ride on a conventional bike! Then I heard about electric bikes, so decided to try one. I borrowed one from Take Charge Bikes for two weeks, for free, through Bath & North East Somerset Council’s loan bike scheme (sign up here: https://betterbybike.info/start-cycling/get-a-bike/loanbikes). I was so impressed, I bought one – ebikes are the way forward! That was in September 2017 and since then I have ridden 1,500 miles in about 10 months. 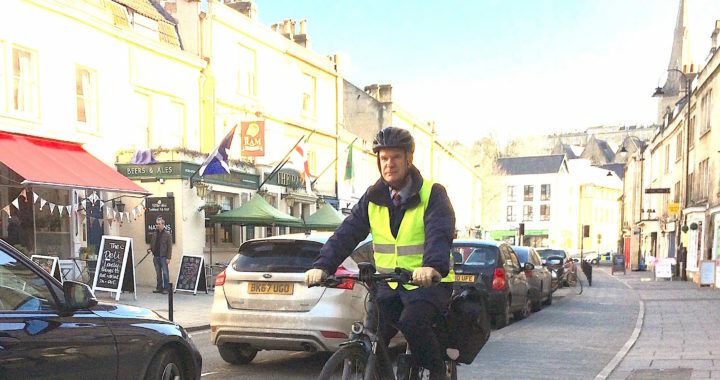 In my role as a cabinet council member I’ve been looking at ways to reduce congestion and improve air quality in Bath, and decided I wanted to set an example by travelling in a sustainable way myself. 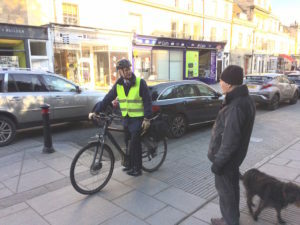 I now commute by ebike every day and use it for about 60% of my work travel, such as to meetings around Bath and in Saltford and Newton-St-Loe. For business travel further afield I use the train 30% of the time, and car 10%. Before I bought my ebike, 100% of my work travel was by car. There are three main benefits for me of riding an ebike. The first is to the environment, by reducing my carbon output. I find having mobility by a means that doesn’t harm the environment a great joy. The second is my personal health: am I fitter? Yes! Third, I travel much more quickly than if I were driving, as I don’t get caught up in the traffic jams. When riding my bike, I use the lowest assistance setting for as long as possible to save the battery – I only need to charge it once every two weeks usually, so get a good range from the battery. I also switch off the motor when I don’t need it, such as going downhill. Battery charging costs are negligible, and the price of a service is insignificant compared to the cost of car servicing. I would urge anyone who lives in Bath to take advantage of the council loan bike scheme and give it a go. Just think ‘safety first’ when riding on the road – and enjoy!